In my previous post, Aperture 3.0.1 Fixes a Lot, but Not All, I raised the issue that the IPTC metadata I was entering in Aperture 3 was not appearing in the Photoshop CS4 "File Info" box after export from Aperture. Initially, I thought this was a bug in Aperture. But after a little digging, I discovered that Bridge CS4 was displaying my metadata properly. What gives? Why would Bridge show it and Photoshop not? It appears that we're in the middle of a standards transition. Looks like Aperture 3 is embracing the current specification, as is Bridge CS4. Photoshop CS4 seems to be following an older approach to displaying metadata. 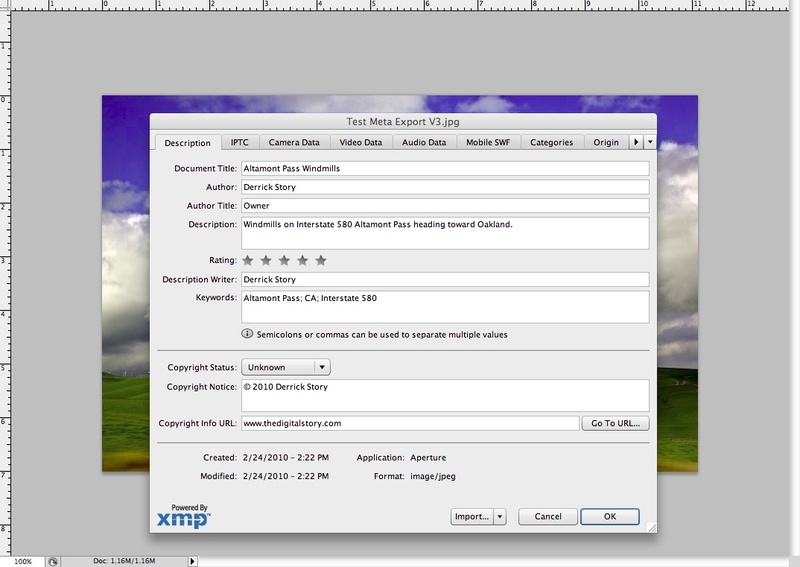 If you haven't created a custom metadata template in Aperture 3, it's easy. Just choose "Edit" from the popup metadata menu in the Metadata view. I then exported a Jpeg as I normally would. But instead of opening it directly in Photoshop, I opened it in Bridge CS4 first. Nearly all of my IPTC data is there. Great! If I want this same data to appear in Photoshop, all I have to do is edit any of the fields. 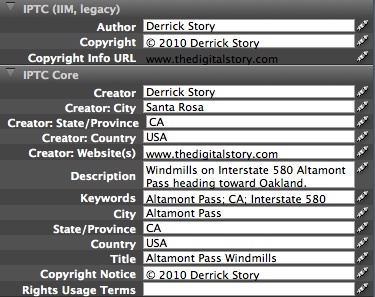 A one character edit will work, but I filled in the missing "Copyright Info URL" field. Then click on any other thumbnail, and Bridge will ask you if you want the metadata updated for the picture you were perviously viewing. Yes you do! So, click "Apply." Yes, this is a workaround that involves an extra step. But it's easier than having to reenter all of your metadata in Photoshop. And it keeps your information consistent. The bottom line is that Aperture 3 is exporting your metadata. And as other applications update to the current standards, this workaround should soon go away. To learn more about Aperture 3, check out my Aperture 3 Essential Training on Lynda.com. Also, take a look at our Aperture 3 Focus Section. Tons of free content about how to get the most out of Aperture. Thanks for the update. While I mention this updating metadata with Adobe Bridge for CS4 work-around in my "Apple Aperture 3 Metadata Issues" article (at http://www.controlledvocabulary.com/imagedatabases/aperture3.html), it is important to note that this doesn't fix everything.... there are still issues with the Date Created, Rights Usage Terms, IPTC Subject Codes and Intellectual Genre fields not appearing in other applications, and with some applications it's even worse. Also note that it's not really a case of Apple "embracing the current specification" as they have only implemented IPTC Core 1.0, which was released in 2005. IPTC Core was updated in 2008 and a new IPTC Extension was added. These are the "current specifications", and neither of these newer schemas are being used in Aperture 3. That said, Photoshop CS4 and Bridge for cS4 have not yet implemented these new schema / specifications either (CS4 was released in 2008 about the same time the specs were published). However, my understanding is that these will be available in the CS5 release. What will happen then is unknown. My hope is that this will reconcile the situation. However, the method that Apple has adopted for writing the metadata to files is different from all the rest of the applications that I have tested, so it could be a rocky road ahead. All Adobe applications, as well as Expression Media, Photo Mechanic, AtomicView, and many others "synchronize" any values that appear in both the older binary form of IPTC (IIM) and the newer IPTC Core (stored as XMP). Instead of synchronizing, Apple writes values that are part of both schemas ONLY into the older binary form. This is the main issue that is creates problems that will have to be resolved. See the article I reference above, which includes a link to a chart which shows which fields appear in various applications and how they differ by file format. Note that while Bridge for CS4 will show most values correctly in JPEG, TIFF and DNG files -- that is, all fields except Date Created, Rights Usage Terms, IPTC Subject Codes and Intellectual Genre -- it doesn't work at all if you are exporting proprietary RAW files (like NEF or CR2 files). This is true regardless of whether you are "Embedding IPTC" or writing XMP sidecars. Hi David, Really appreciate you taking the time to add your findings to this discussion. It definitely helps. Derrick - thanks for the article, and David for the follow up comments. I'm very eager to see where all of this goes. It sounds like a mess. I think I'm going to stick with Adobe products for my metadata entry. Seems like Apple's always been a bit behind on this front. Only in version 3 did they come around to XMP import, which seems late to me. Also, I find the continued lack of support for hierarchical keywording a major disappointment. Lightroom blows it away in this regard, supporting not only hierachies that pass on parent attributes to child tags, but synonyms as well. This is invaluable to me, as I can add one tag to an image and have half a dozen or more tags added when the file is exported. Aperture continues to disappoint on the metadata front.